At NAB2018 , Globecast is going to show the firm's new Cloud Channel Playout solution for SD, HD and 4K channels at Stand SU11406CM. This is a media management service that provides market-friendly solutions to customers. Cloud playout significantly enhances service deployment efficiency, reduces time-to-market, and allows broadcasters to reach new international markets with lower upfront investment. This approach provides the ultimate in flexibility. The number of channels can be dynamically increased or reduced and the channel branding mix reshuffled for particular audiences and events. The new Cloud Channel Playout service from Globecast also provides broadcasters with an opportunity to increase revenue from international markets by localization of advertisements, programming and channel branding at a country level, or even at a per-affiliate level, based on local consumer needs. Globecast liveSpotter — this offering is a live-to-VOD packaged content service provides customers with the ability to create monetizable short-form content quickly and efficiently, via an end-to-end solution — from signal-to-screen — from a single supplier. 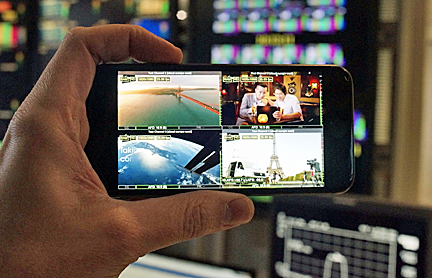 Globecast liveSpotter, which is available globally, is a significant extension of the company’s highly evolved media management capabilities and reflects the rapidly changing way that we consume content. It allows unlimited short-form VOD content to be created from a live feed, very quickly — close to real time — and for that content to then be shared across OTT, VOD and of course social media platforms. Globecast XN – The company will also be showing their fast set-up distribution solution over public internet technology, GCXN. With its worldwide footprint (with more than 50 sites), the company offers limitless video Internet delivery as a service solution. Customers can confidently entrust their main distribution, disaster recovery and monitoring services with broadcast-grade quality to GCXN. They can reach new audiences with secure and robust transport over the public internet for content distribution. Globecast is also providing an enhanced remote management system for end-to-end service management. Content Acquisition, Aggregation and Distribution (CAAD) — Globecast aggregates and distributes premium worldwide content for the international marketplace and caters to 15 foreign language communities. More than 100 TV channels are currently acquired, processed and delivered for broadcast as part of the line-up of several payTV platforms worldwide, including: Verizon FiOS, Frontier Communications and Cox Hospitality. Platform and content protection with Business Continuity — With the increasing threat from exposing content to the internet, it is critical today for broadcasters to ensure content security. Globecast’s sophisticated Media Facility in Culver City, California, at their provides a range of disaster recovery solutions for tier-one programmers from a simple server with a loop of “evergreen” content, through cloud solutions to a full mirror of the primary master control operation, keeping customer businesses running through all eventualities. In addition, Globecast is working with its parent company Orange to provide cyber defense solutions to help protect priority IT platforms (OTT, VOD and playout).